MANILA, Philippines - Senator Chiz Escudero and actress Heart Evangelista were pronounced husband and wife today, February 15 at around 5:20pm. View wedding photos here. 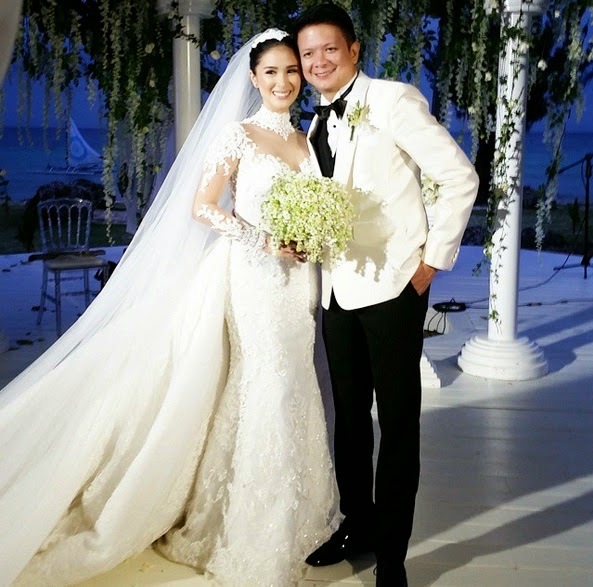 Heart and Chiz tied the knot in a Catholic wedding ceremony held at the Balesin Island Club in Quezon. The romantic wedding is inspired by the Hollywood movie, Edward and Bella's The Twilight Saga: Breaking Dawn. The ceremony was officiated by Bishop Arturo Vasquez, a close friend of Senator Chiz from his hometown in Sorsogon. Concelebrating the Mass were Fr. Jerry Orbos and Fr. Roger Joseph Erestain, who are also close to the groom. President Benigno 'PNoy' Aquino III who was supposed to be Chiz's best man, was replaced by Phillip Escudero, Chiz's brother. Meanwhile, Heart's older sister Camille Ongpauco was the maid-of-honor. Chiz revealed to the press that he asked PNoy to skip the Balesin wedding and invited him to the Manila reception on February 18 instead. Some of the big names in showbiz, business and politics have attended the ceremony. Principal sponsors include business tycoons Hans Sy, Lance Gokongwei, Fernando Zobel, Bobby Ongpin, Jerry Acuzar, Ramon Ang and Vic del Rosario. Reports said that the newly-wed couple will spend honeymoon in Japan. Before the wedding ceremony, Heart celebrated her 30th birthday of Valentine's Day. Heart and Chiz became couple for more than two years before their marriage. Chiz was married to Christine Flores for seven years until he announced their marriage has been annulled. They have two children.